Madison Area Mothers of Multiples hosts two resales each year. MAMOMs Fall/Winter resale (September) includes all baby and kid items including Fall/Winter clothing as well as seasonal items like Halloween costumes and winter holiday items. The Spring/Summer resale (April) includes clothing for hot and cool weather (swim, shorts, sweatshirts...) and items for summer. We gather over 100 sellers and organize their gently loved, high-quality clothing sizes 0-16, shoes, baby equipment, nursing items, strollers, car seats, books, games, toys and many other items! Don’t miss this resale event!! You'll get our items at a fraction of retail prices. And we host the event at Keva Sports Center, so you can shop these high-quality goods in a spacious setting! Public Shopping Hours: 9:30 a.m. - 12:00 p.m. If you are interested in becoming a Seller, or would like to volunteer at our 2019 Spring Resale event, registration will be open from March 1st, 2019 through March 31st, 2019. For more information regarding our Resales, please contact our Resale Coordinator, Katie Salkowski (resale@mamoms.org). ADMISSION FEE: $3.00 (Cash Only) to help defer the cost of rental fees. METHOD OF PAYMENT: Cash (preferred), but Credit Cards are also accepted. NO (mobile) CHILDREN are allowed on the floor until the last hour of the sale. We recommend bringing your child(ren)'s measurement information for sizing, and we also encourage infant wearing. Starting at 11AM, families may bring well-supervised children to the sale. NO STROLLERS are allowed in the Resale shopping area. B.Y.O.B. - Bring your own bin or bag. Laundry bins work well or even large 31-type bags. Reusable grocery bags are also a fantastic choice! Please DO NOT put items back on the tables after you have had them in your basket or bag. This is to ensure fairness to all sellers and shoppers, due to the short shopping time span. 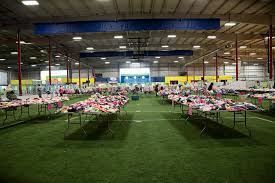 Pregnant Members of MAMOMs will be admitted to the Resale at 8:30 a.m.
General Members of MAMOMs will be admitted to the Resale at 8:45 a.m.
Are you interested in selling at our 2019 Spring Resale event? If so, we do have a limited number of spots for non-MAMOMs-member to consign! Because we are a non-profit organization, we have the lowest rates in town. When you also sell and volunteer at our Resale events, you retain 80% of your sales, and contribute only 20% back to the MAMOMs' organization. Don't have time to volunteer? Contribute just 27% of your sales. If you are a MAMOMs' member, the consign fee is flat fee of $55.00. Volunteering during the Resale or contributing in other ways may help reduce the consign free. When you're ready to start tagging your items, watch these two short video clips to help you get started! We set-up, run, and take-down each Resale in less than 24 hours! That takes a ton of organization! These are the resale guidelines that keep our Resale running smoothly. The most referenced item in our Resale guidelines is a list of categories into which you sort your tagged items. Here is a list of the Resale Categories (PDF) - when dropping off items, each category should be sorted into its own bag or box. NOTE: Any seller wishing to sell a car seat MUST complete a Car Seat Form. Volunteers set up the Resale on Friday night 4:00 p.m. - 8:00 p.m and run/clean up the Resale on Saturday from 8:00 a.m. - 2:00 p.m. Volunteers who work one shift may shop the Resale on Saturday morning at 6:00 a.m. Volunteers who work the whole Resale may shop Friday night after set-up is complete.